Mazda developers fine-tuned the new Mazda MX-5’s chassis systems at Germany’s legendary Nürburgring Nordschleife, pushing components like brakes, tyres and dampers to their limits. The 21 km long track with 73 curves, which hosted the Formula 1 German Grand Prix until 1976, challenges chassis and suspension like no other circuit in the world. Driving 10,000 km here is equal to 200,000 km of normal driving, which is the average life span of a car. And Mazda testing on the most beautiful and demanding race track in the world paid off. In the end, the third-generation Mazda MX-5 lapped the Nordschleife 15 seconds faster than its predecessor. Stronger engines, larger brakes and tyres, a stiffer body shell and an especially well-balanced chassis made this leap in time possible. After two years absence, Mazda engineers are once again regular guests at the Nürburgring and the new Mazda MX-5 is the first new model to profit from this. "The Nordschleife is more like a normal road than a modern race track. That makes it so attractive for us," said Yasuyoshi Mushitani, chassis engineer responsible for European testing. "The circuit changes constantly, partially due to the erratic weather, partially due to the track’s different surfaces. Every curve has a different grip level and a different gradient. Several curves slope outwards with adverse camber, for instance. The curve radiuses vary as well, but the toughest are those curves where the vehicle and passengers are literally pressed together. If a bump comes while you’re steering into the curve here, then the force applied to the chassis is extreme." Although the Mazda development team had already done the bulk of chassis and endurance testing at their home proving grounds in Miyoshi, Japan, the old Nürburgring was seen as an essential test location for fine-tuning the new Mazda MX-5’s chassis systems. "We drive a pre-determined number of laps and observe, for example, what the temperature is in a damper," said Alexander Fritsche, Assistant Manager at Mazda’s European R & D Centre. "With the brakes, we not only test the temperatures involved, but also brake pedal feel and brake system stability." Tyre testing was also very important: "Special types of tyres could only be eliminated after Nürburgring testing," said Fritsche. "A tyre that causes no problems on normal roads can disintegrate after a few laps around the ’Ring." After resuming test driving on the Nürburgring race track in May 2004, Mazda expanded their test efforts to the surrounding country roads and even to the autobahns. The German Eifel area has advantages as well. The autobahns are relatively empty and have no speed limits; the country roads are not all smooth and have various surfaces. "For us it was important that the new Mazda MX-5, besides its basic sporty concept, also be a dependable and easy to control companion in everyday driving," said Fritsche. "The focus of our tuning here was linearity." On the autobahn, Mazda drivers tested the stability of the new Mazda MX-5 during high-speed driving, especially during fast lane changes. On two-lane roads, tests were conducted on things like brake feel, steering and throttle pedal response, slow-speed comfort, as well as transmission and differential tuning. 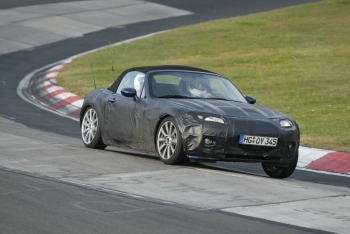 The test schedule also took the new Mazda MX-5 to the county of Essex in England. Here in classic roadster country there are small roads with lots of tight curves, garnished with rough and porous surfaces. Similar conditions greeted the test crew around the Glen Eagles, Perth & Kinross region of Scotland. Chassis philosophy for the new Mazda MX-5 is based on the Japanese ritual of Jinba Ittai – the symbiosis between horse and rider. This unity served engineers as a guiding principle for developing the driving attributes of the new Mazda MX-5. However, instead of concentrating on pure speed, they strove to realise the ideal of a well-balanced driving machine that would allow skilful drivers high levels of driving enjoyment without the need of a large-displacement engine. The third generation Mazda MX-5 is now on sale across Australia.